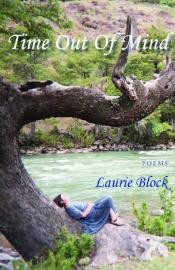 In the foreword to this moving, honest and luminous collection of poems, Laurie Block inscribes the last coherent words his mother said to him: I used to be quite fond of you. Shortly after that, she lost what remained of her senses and sank into the vegetative state in which she spent her last years. Lights Out, the first section of Time Out of Mind, is the poet’s journey into a darkness that is only in part his mother’s. He writes to touch the borders of consciousness and emerges with a map of the mind and body in extremis. Many of these poems are rooted in disorientation, displacement and loss of equilibrium, the friction between what happens outside the skin and what may be taking place on the inside. The poet believes that we value consciousness as somehow more concrete, enduring and linked to assumptions about identity than our bodies. He therefore asks the question: Is the self first a face or a soul?